A coconut is the fruit of the coconut palm, Cocos nucifera. Coconuts are believed to be native to Southeast Asia, where they have been cultivated and used in food for centuries. Early Spanish explorers called it coco, which means "monkey face" because the three indentations (eyes) on the hairy nut resembles the head and face of a monkey. Nucifera means "nut-bearing." Various coconut products can be found in the cuisine of many Asian nations, and they appear in other tropical diets as well, especially in the Caribbean. The distinctive flavor of coconut makes it a very popular food, and a wide range of things are made with coconuts, from palm wine to coconut cream pie. Technically, a coconut is a drupe, which means that it has a hard shell encased in a fibrous outer layer. When the coconut shell is cracked open, it reveals a fleshy white meat and a liquid which is known as coconut water. Cracking open coconuts is no mean feat; a number of techniques are used, ranging from baking coconuts to make them brittle to dropping them onto sharp rocks in an attempt to wedge open a crack in the shell. The water inside a coconut is not the same thing as coconut milk, a popular creamy product which is actually made with the flesh of the coconut. Coconut water is crisp, cool, and refreshing, and it is often used in drinks in tropical regions. It is also high in vitamins and minerals, making it popular with the health food community. Coconut milk is made by grating the flesh, soaking it in hot water, and squeezing it, extracting a very rich, dense white liquid which is very high in protein and fat. Coconut milk is often used in curries and soups in tropical nations. It is also used to flavor drinks and desserts. The flesh of coconuts can be grated and toasted as a garnish, added whole to desserts, chunked in soups and stews, and it may be fresh, dry, or roasted, depending on the dish and regional preferences. Like coconut milk, the flesh of coconuts has a high protein and fat content, and it has a very rich flavor. Sap from coconuts is fermented to produce palm wine, while the leaves are used for thatching and the bark is sometimes utilized as a source of fiber. The fibrous outer shell is sometimes used as a fiber as well; this fiber is known as coir. Coconut trees can also provide timber for construction projects and a source of fuel. There are numerous other uses for coconuts and the trees they grow on, explaining why the trees have become so popular in the tropical regions where they grow. With all the health, nutritional, and body care benefits that you get from coconut oil, there is no doubt why this has been hailed as the "miracle oil". While coconut possesses many health benefits due to its fiber and nutritional content, it's the oil that makes it a truly remarkable food and medicine. It is said to prevent and cure many sicknesses that are almost impossible to heal. Being a healthy oil, it could help decrease viral load of HIV patients, could improve insulin production and thyroid function, it could reduce the risk of diabetes complications, and could even fight heart disease which is the leading cause of death. Coconut oil improves the performance of the digestive system that can make a person lose weight. In traditional medicine around the world coconut is used to treat a wide variety of health problems including the following: abscesses, asthma, baldness, bronchitis, bruises, burns, colds, constipation, cough, dropsy, dysentery, earache, fever, flu, gingivitis, gonorrhea, irregular or painful menstruation, jaundice, kidney stones, lice, malnutrition, nausea, rash, scabies, scurvy, skin infections, sore throat, swelling, syphilis, toothache, tuberculosis, tumors, typhoid, ulcers, upset stomach, weakness, and wounds. In addition, coconut oil may also solve skin problems like acne, pimples, black heads, eczema, psoriasis, or as simple as dry skin. Once mistakenly believed to be unhealthy because of its high saturated fat content, it is now known that the fat in coconut oil is a unique and different from most all other fats and possesses many health giving properties. It is now gaining long overdue recognition as a nutritious health food. Coconut oil has been described as "the healthiest oil on earth." That's quite a remarkable statement. Acne is common during the stage of adolescence due to some hormonal changes experienced in puberty. One of these hormonal changes is the abnormally excessive secretion of oil (sebum) by the sebaceous glands. When bacteria mix up with sebum, then there is acne eruption. Coconut oil contains medium chain fatty acids that boost the metabolic process in the body. Ingesting coconut oil can improve metabolism that enhances cell and hormonal functions. As a result of better digestion, there is regulated excretion of oil by the sebaceous glands. Putting coco oil on your face also melts bacteria clogged up in the pores. Healthy scalp would mean healthy hair. Lauric acid converted into monolaurin is one of the antimicrobial properties of coconut oil. This acid is also found as ingredient in soaps and shampoo. By applying coconut oil, your scalp is kept moisturized and protected from fungi that cause dandruff. Healthier and shinier hair is also one of the coconut oil benefits. To keep your hair from being dry and unmanageable, spread an ample amount of coconut oil from the roots to the tip of damp hair. Do not put too much or your hair might get greasy. Many people experience dry skin. Untreated dry skin can cause premature wrinkling and ageing in the long run. A solution to this is applying extra virgin coconut oil as alternative to your other body lotions. The usual lotion that you use primarily contains water that easily evaporates, thus, drying your skin. Coconut oil prolongs the moisture on your skin making it smooth and soft the whole day. Coconut oil cure can also be true to eczema. Eczema, an inflammation of the epidermis, is caused by hereditary factors, allergens like dust, pets, or plant pollens, and irritants like smoke or solvents. As a result, a person experiences itching, flaking, dryness, or even bleeding of the skin. Moisturizers are very important treatment for eczema and coconut oil is best for lasting moisture for the skin. This same effect of coco oil also treats psoriasis. Maintaining a coconut oil diet is beneficial for your internal body system. Coconut oil diet is done by changing your usual cooking oil with refined coconut oil and taking three to three and a half tablespoons of virgin coconut oil as supplement everyday. The medium chain fatty acids (MCFAs) in coconut oil greatly contributes in boosting the digestive system that improve the performance of cells and hormonal secretion of glands. Also, coconut oil contains antimicrobial lipids, lauric acid, capric acid, and butyric acid that are helpful in fighting infections, yeast growth, and killing disease-causing bacteria. Coconut oil and thyroid, Hypothyroidism is a state when the thyroid glands are not producing sufficient thyroid hormones. Coconut oil plays a major role in improving thyroid function. Diabetes is a syndrome of a metabolism disorder resulting to high blood sugar levels in the body. Insulin is a hormone that assists the blood sugar to enter the cell and be converted as heat and energy. There is better production of insulin with the help of MCFAs present in coconut oil. Common fats are not easily absorbed by the cells as nutrients. Instead they are stored as body fat until they get clogged in the arteries and blood vessels. This clogging disrupts blood circulation and leads to heart ailments. MCFAs in coconut oil, being more soluble, are easily converted into nutrients in the metabolic process. So, if you use coconut oil, you would lessen the fear the risk of heart disease. The medium chain fatty acids also aid in the calorie-burning activity when your system is digesting food. This means you can lose weight in using or ingesting coconut oil. Note: Since coconut oil enhances the digestive system, it is advised that taking and using coconut oil is done gradually to give the system time to adjust. Ingesting big amounts of coconut oil immediately may cause diarrhea, so small amounts at a time will do until you are ready for a regular dosage. Candidiasis happens when Candida species grow uncontrollably in the small intestine, vaginal canal, or the mouth until it affects many parts of the body including the intestinal tract. These fungi can grow in years causing inflammations and discomforts in humans like respiratory infection, painful urination, chronic rashes, oral yeast infection, vaginal discharge, impotency, among many others. MCFAs in coconut oil have antifungal properties (like lauric acid) killing bad bacteria, fungi, and yeast like Candida. Since MCFAs present in coconut oil facilitate better absorption of nutrients from the food to the body, thus, there is also faster absorption of calcium for the teeth and bones. Because of calcium absorption, coconut oil helps prevent osteoporosis – a disease of bone that can cause fractures. Other than lauric acid and medium chain fatty acids, coconut oil also contains butyric acid which is said to be an anti-cancer agent. Coconut oil can also benefit the HIV and AIDS patients. A nutritionist and coconut oil advocate Dr. Bruce Fife, once shared about a story of an HIV patient. This man stayed in a rural place where he maintained a coconut diet and an organic lifestyle. His viral count decreased and he became more energetic. The first clinical study about coconut oil being effective treatment for HIV was reported by a Filipino pharmacology professor, Dr. Conrado Dayrit. This study has confirmed that coconut oil can reduce the viral load of an HIV patient. There are actually antiviral drugs used to fight HIV but they give a lot of bad side effects like vomiting, hemorrhaging, fatigue, and altered mental function. Coconut oil, on the other hand, does not give these side effects to patients. More so, the lauric acid, capric acid, and caprylic acid boost the immune system. As such, coconut oil helps in dealing with virus and bacteria that may cause herpes, influenza, and cytomegalovirus. The soothing effect of coconut oil releases stress. Applying coconut oil on your head is helpful in eliminating mental fatigue. The good fatty acids are key components that make coco oil beneficial to your body health and nutrition. Now that you know these facts, buy coconut oil and use it to gain all the coconut oil benefits. Coconut is a nutritious source of fiber and essential vitamins. The fruit provides coconut milk, oil, juice, water and flesh, which can be eaten fresh or dried. Although it provides a number of health benefits, coconut oil has high amount of saturated fat, which can lead to high cholesterol or weight gain. In rare instances, consuming coconut may cause an allergic reaction. The American Heart Association recommends monitoring your intake of coconut, which contains high amounts of saturated fat. This type of fat elevates your low-density lipoprotein, or LDL, cholesterol levels, which increases your risk of heart disease. Coconut oil contains 11 g of saturated fat per tablespoon, while shredded coconut has 16 g of saturated fat per ounce. Limiting your daily intake of saturated fat to less than 7 percent of your total calories can help keep your LDL cholesterol at a healthy level. A 2006 study in the "Indian Academy of Clinical Medicine Journal" argues that coconut oil is a medium-chain fatty acid that helps control weight gain by stimulating your metabolism. If you use large amounts of coconut oil, have your physician check your cholesterol levels on a regular basis. People who suffer from food allergies, especially tree nut allergies, should consume coconut with caution. Coconut is considered a tree nut by the U.S. Food and Drug Administration. Manufactured foods that contain coconut generally carry a warning that the product contains tree nuts. Most people who are allergic to coconut react to the proteins in the fruit, not the oil. Coconut oil allergies are rare, but may be life-threatening. High cholesterol levels can cause blockage in your arteries, which leads to cardiovascular issues. Coronary artery disease is caused by a blockage or narrowing of coronary arteries that pump blood to your heart. Limit your intake of foods that contain coconut oil if you suffer from high cholesterol or are at risk of cardiovascular disease. Avoid processed or fried foods that contain high amounts of coconut oil or excessive consumption of coconut meat or milk. Consuming excessive amounts of coconut meat, oil or milk may lead to weight gain. 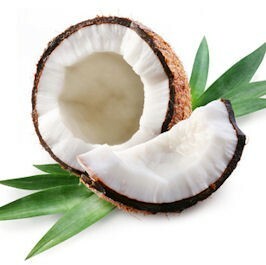 Coconut flesh has 187 calories per ounce, while coconut milk has 445 calories per cup. High amounts of saturated fat in coconut may also contribute to weight gain. To avoid eating too much fat, limit your daily intake to 25 to 35 percent of your caloric intake.